SEE ALL CATEGORIES Need Help? Factory Fresh & Ready to Ship! Why shop at Battery Mart? Whether you have a motorcycle, cell phone, watch, or any other battery powered device, Battery Mart has the aftermarket battery you need. 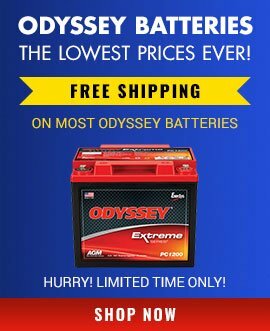 We offer the largest online selection and the best deals on discount batteries, from big 200 amp hour batteries for boats to small button cell batteries you can hide in your hand. You'll find low prices on great brands like Big Crank, Motocross, Renata, Battery Tender, Motobatt, PriorityStart!, Dual Pro, and so many more. We make it our mission to make your shopping experience quick and easy. We offer fast order shipping, no hassle returns with our 45 day guarantee, and amazing customer service from our in-house battery experts which has kept us in business since 1982. When you want to buy batteries online, trust Battery Mart. What's better than an OEM battery? An aftermarket battery! Our selection of batteries goes above and beyond the competition. Many of our most popular batteries are kept in stock at our Virginia warehouse. And if not, they can be shipped directly from our manufacturers to you, brand new and factory fresh! Replacement aftermarket batteries and accessories have the same performance standards as OEM batteries but are significantly less expensive. Battery Mart is a family owned business that's been helping customers for over 30 years. We've shipped over one million orders and helped many Virginia and West Virginia residents keep their vehicles on the road with factory fresh batteries. We don't just sell discount batteries, chargers, and accessories; we work with them every day, passing that expertise on to you. With a selection of over 1,000,000 replacement batteries and accessories it can be overwhelming to find what you need. Our team of Battery Experts have over 100 years of combined experience. Give us a call and let us help you find exactly what you need.